Today, a new 85 gallon (320 l) aquarium came from the house of my friends. It was an extra at their home. My friend installed some soundproofing for the power filter chamber from the gym mat. The whole setup is a little bit DIY, but it is working. He also drilled holes to the filter cabinet for wires and hoses. There was a 10 cm lifting stand mounted on the base to raise the aquarium. The original stand is a bit low, and the aquarium itself is also low. However, I can not put the stand any further up, I’m not that long, and I need reach to the bottom of the aquarium also. 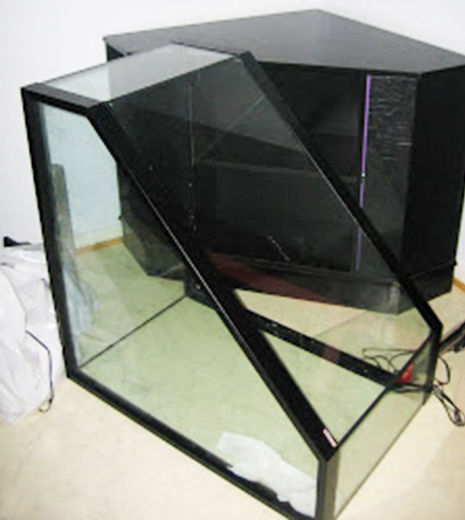 The aquarium is angular, made of plexiglass, so it is quite easy to move. Overall the tank and stand are in excellent shape. The tank is from Tropeakvarier. Googling made it clear that it is a Danish design (tropeakvarier.dk). My friend bought it from the yard sale, so no idea how it came to here! For the lightning I would like some metallic or the like, new ones are quite pricey, probably I will be looking for used one. Until I find something suitable, I can use my friend’s old and little bit inefficient light, but anyway it is working still. The filter is Eheim 2017. I’ll probably take also a small filter as a trash collector. The heater comes from Hydor’s. I like Hydor’s heater; it has temperature control scale, which is not exact, but nice anyway, and I shouldn’t have to worry about it getting water inside so easily. Anyway, it is clear to read and see whether or not to warm up. As a backdrop to this new aquarium, an exterior wall tile is what I’m after. It should be water-resistant, unlike interior tiles. The color is pretty lukewarm, reddish brown. 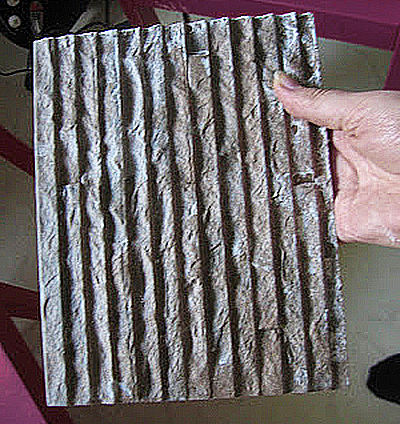 The tiles I will attach with clear aquarium silicone. The tile has an uneven surface that will hopefully add some vitality, as well as lights and shadows.